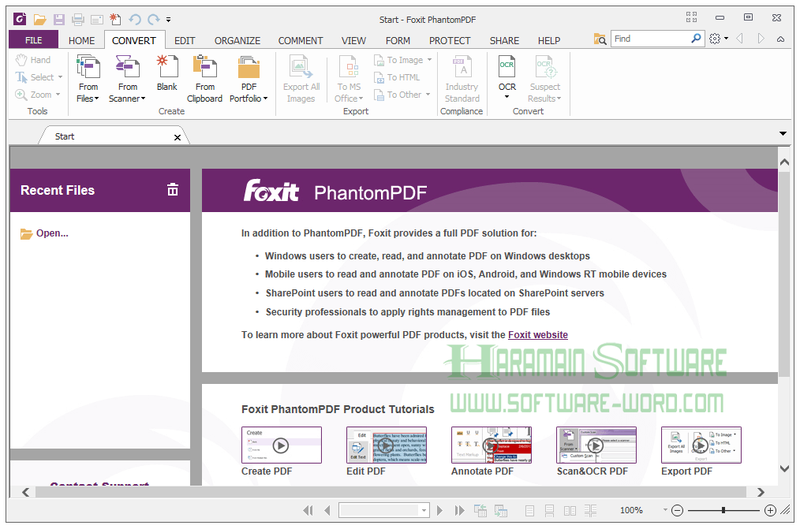 Foxit PhantomPDF Business 8.1.0.1013 Multilingual adalah aplikasi PDF multifungsi yang dimana bisa digunakan untuk membuka dan mengedit file PDF dengan sangat mudah dan juga bisa digunakan untuk mengconvert atau mengubah file microsoft office kedalam bentuk PDF serta bisa juga untuk mengedit hasil scan OCR sehingga akan sangat memudahkan pekerjaan. Software yang bernama Foxit PhantomPDF Business merupakan saingan berat dari Adobe Acrobat dan juga NitroPro yang memiliki fungsi yang hampir sama yaitu untuk masalah file PDF baik itu membuka, mengedit, membuat, maupun mengconvert. Seperti biasa haramain software membagikan versi full version karena dilengkapi dengan patch dan juga registrationnya agar menjadi full version dan bisa sahabat haramain software gunakan secara gratis. XFA Form Filling – XFA (XML Form Architecture) form allows you to leverage existing XFA forms. High Performance – Up to 3 times faster PDF creation from over 200 of the most common office file types and convert multiple files to PDF in a single operation. One Click PDF Creation – Creates PDF document with a single mouse click from Microsoft Office applications like Word, PowerPoint, and Excel. Convert PDF to DOC, text, and image formats – easily shares content with other applications like Microsoft Word. Robust Document Security – Using password protection, certificate encryption, and digital signature tools. Redaction – Lets you permanently remove (redact) visible text and images from PDF documents. Document Certification – Indicates you approve of its content and allows you to specify the types of changes that are permitted for the PDF to remain certified. Microsoft Active Directory RMS Protector and Policy Manager – Extends the usage control benefits of Microsoft Active Directory Rights Management Service to all your PDF documents and allows the author the control of document features within each PDF. Form Design – Easy to use electronic forms design tools to make your office forms work harder. Enables you to create or convert static PDF files into professional looking forms. Form data import tools allow data to be automatically imported into a form reducing manual key entering and input errors. Optical Character Recognition – OCR support to convert scanned or image-based content into selectable and searchable text. Create industry-standard compliant PDFs from any printable file, PDF/A supported – Since Foxit products are ISO 32000-1 / PDF 1.7 standard compliant, they are compatible with other PDF products like those from Adobe. PDF Optimizer – Optimizes PDF document to reduce the file size. Betul Muhammad Irham. Saya sudah patch tapi tetap aja 1 of 14 katanya. Artinya akan expire setelah 14 hari.